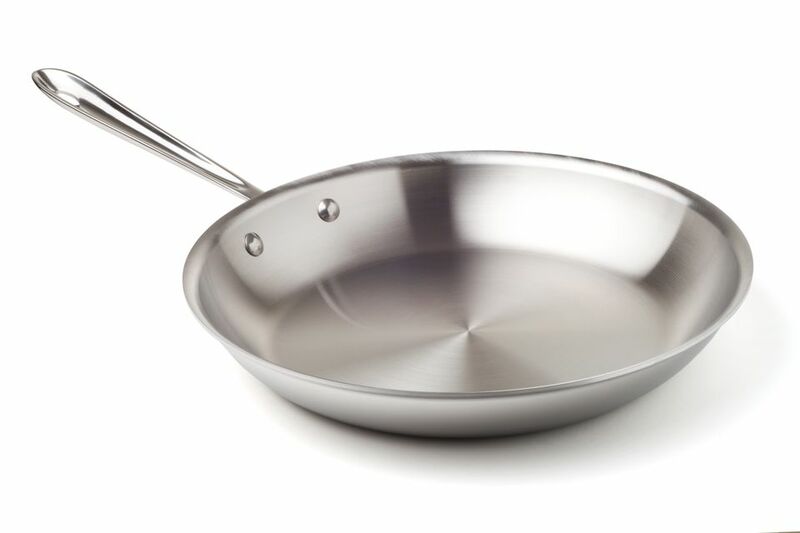 Hard anodized aluminum is used in a variety of cookware. The process keeps the metal from reacting with acidic foods and provides a hard, smooth surface that is very durable. Aluminum conducts heat well and is a less expensive metal. The term anodized means that a material, such as the aluminum in cookware, has been subjected to an electrolytic process, where natural oxidation has been controlled. This involves immersing the aluminum in a chemical bath and applying an electrical current to it, causing oxide to be produced from the resulting rust on the aluminum. This layer of oxide hardens the aluminum and makes it resistant to corrosion. Hard anodized is an extension of the process using higher voltage and lower temperature, which results in an even harder and more durable cookware coating. Anodized aluminum has many applications for consumer products and industrial building materials. Color can be applied to the oxide due to its porous nature. This lightweight, durable, corrosion resistant, and salt resistant material is also used in the manufacturing of electronic equipment. Cookware or bakeware that is hard anodized is assumed to have a much more durable cooking surface than some other nonstick finishes. You can use any kind of utensil in a hard-anodized pan and you should not have to worry that you will scratch it. While it has a smooth surface that should reduce sticking, it is not completely non-stick. Some food may stick to the surface, making it hard to clean. You may want to use this kind of cookware for liquids and movable foods. If you do need to clean it, you can use regular dish soap or a gentle scrub brush to lightly remove debris. Harsh cleaning products and steel wool materials should be completely avoided. Even though hard anodized cookware has a more durable finish, it should be properly stored to prevent scratches in the finish or dents in the pans. There are various ways to store cookware including using a pot rack, designating a cabinet space, or using in-cabinet slide-out racks. Specially treated aluminum like this is twice as strong as stainless steel. While you can stack multiple pieces on top of each other, you don't want to put it on top of or inside of other pots and pans from different brands, as the hard surface can cause damage to them. There are worries that there are some potential health risks by cooking with anodized aluminum. Although it's less likely to corrode and end up in food, people are often uncomfortable using it due to some concerns that it could be harmful. However, there isn't any conclusive scientific research that suggests it's dangerous. Quality anodized aluminum cookware is fine to cook with. However, ordinary pots and pans made from non-anodized aluminum (or those with scratches) can allow acidic liquids like tomato sauce to react with the metal, allowing you to consume it. Any tiny amount of aluminum from hard-anodized cookware would be insignificant. The Centers for Disease Control notes that the average adult ingests 7 to 9 milligrams of aluminum in food due to aluminum compounds added during processing. They absorb less than 1% of swallowed aluminum. Drinking water is another common source of aluminum.